Posted 3 years ago on Thursday, March 24th, 2016 by James S.
A Ford F-150’s blend door is the device that controls how much heat or AC comes through the HVAC system. For the last 20 or 30 years in these trucks, they have been prone to failure. I love my truck, but I wish Ford had fixed this problem by now. 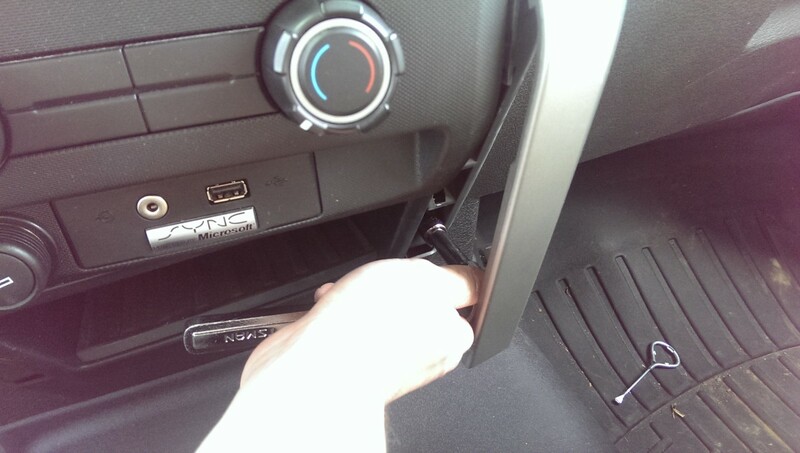 On the plus side, where older generations required disassembling the dash to fix, the 2009-2014 generation’s most common problem can be fixed with the dash left in place. Truthfully, the work isn’t really that bad. 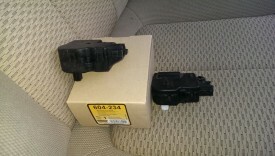 The replacement actuator, available here online or at a local Autozone, costs between $20 and $35. You’ll know you need to perform this procedure if you hear a loud, persistent POP noise whenever you switch your HVAC to “full cold”. 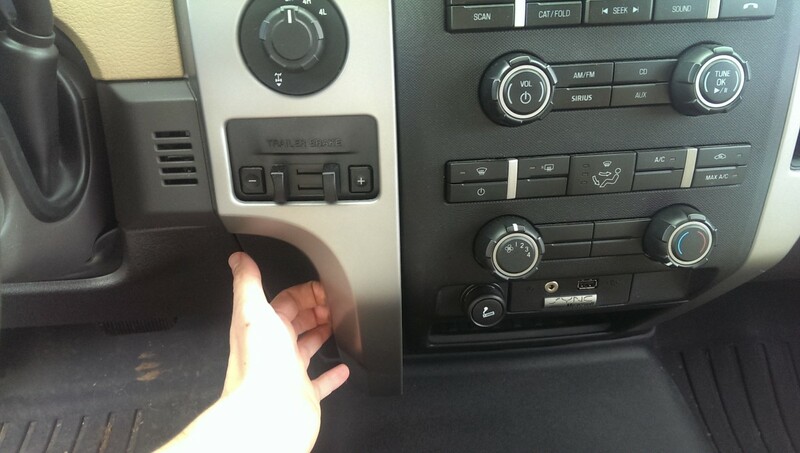 If you switch it towards heat a little bit, and the noise stops, your F-150 blend door actuator has gone out. A common issue in these trucks is the failure of the potentiometer that senses when the actuator has turned fully. The truck effectively doesn’t “know” how far to turn the door. The popping noise is the actuator trying to turn further than it is able to. Fortunately, this job isn’t nearly as bad as in older generations of F-150s. It can be done in < 30 minutes and only requires a $30 part. If you get a mechanic to do it, it generally costs an hour or two of labor. 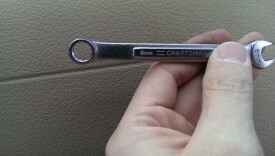 You need an 8mm box wrench, along with a 7mm or equivalent SAE socket and socket wrench. I used a paint can opener to help pull the plastic off. 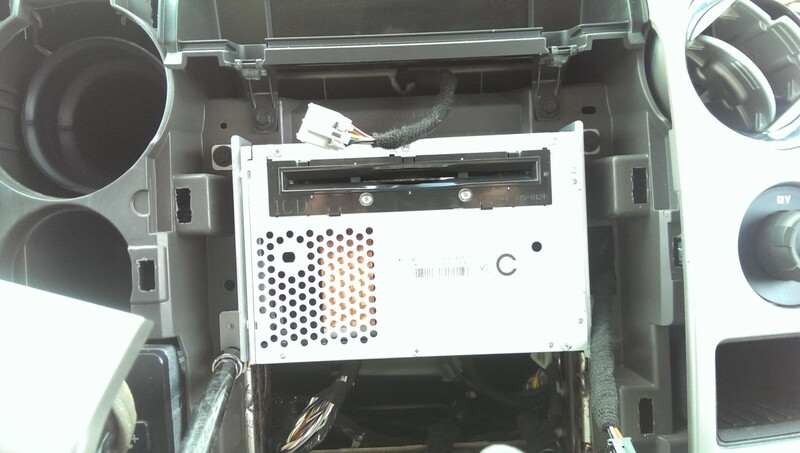 The blend door is actually behind the radio, so the first step is to get the radio out. The silver panels on each side of the radio simply pull straight out as pictured. This panel will pull entirely out, if you lift up just slightly on the other paneling it is caught behind. You don’t have to pull it out all the way like this, you can instead just pull it out an inch or so to get to the radio, as I do with the panel on the right in the next step. The panel on the right side comes out the same way. This one is a bit more of a pain to fully remove, so I just left it as pictured. This is enough to get access, so you can do this on both sides if you prefer. 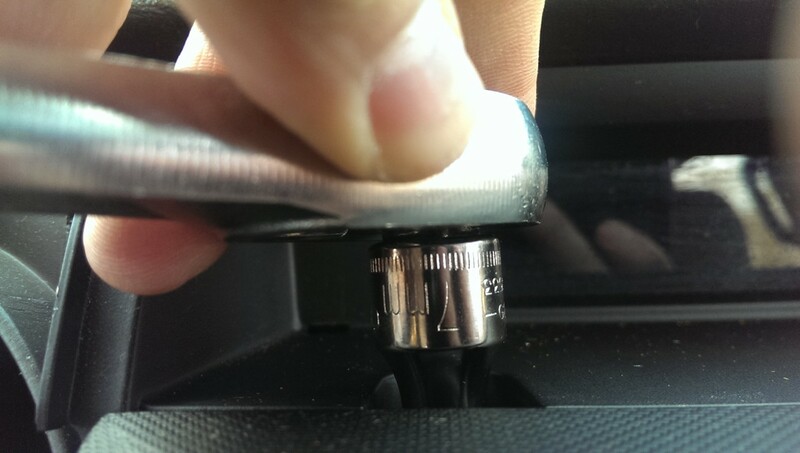 The radio has a piece of rubber trim hiding two of the bolts that need to come out. You can simply pry this up and pull it out. It doesn’t really lock in place or anything, it just sits there inside of a groove. 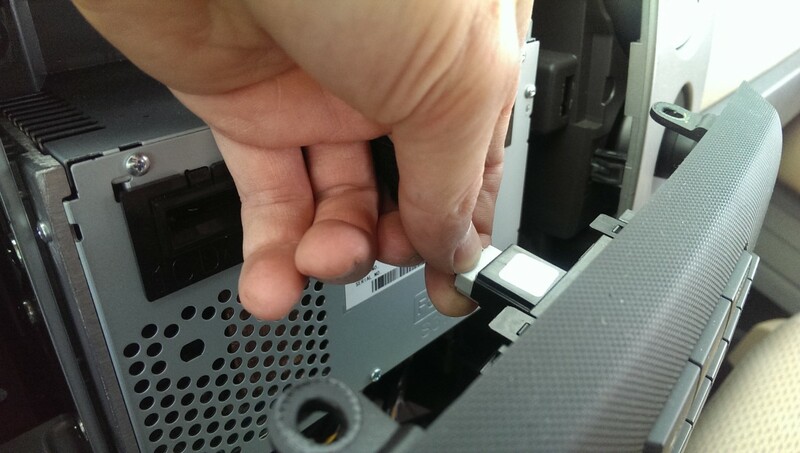 There are two screws underneath the rubber trim that need to come out. I used a 7mm socket, which fit fine. I assume an SAE equivalent could work as well. 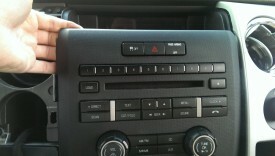 There are also 4 more bolts on either side of the radio, as pictured. They are removed with the same socket. On my truck, the radio and the HVAC controls were connected together, so I had to remove them both as a unit. 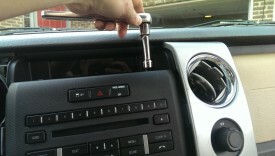 If your truck has a separate radio, you may be able to leave some of these bolts in place. Then, the radio panel itself simply pulls straight out. I started prying from the top. The radio and HVAC controls came out as a unit. I unclipped enough of the connectors to the radio front panel so that it could comfortably hang out of the way. This was primarily the top two. The radio itself has 4 screws, once the panel is off. With the 4 screws removed, the radio just pulls straight out. I unclipped all the connectors, 4 I think, and tossed the radio on the floor of the cab for the time being. Once the radio is out, you can see the actuator. It is the black box on the right. It is held down by two screws, both of which have 8mm heads. The first screw is easy to remove. It’s sitting right in front, easily accessible. 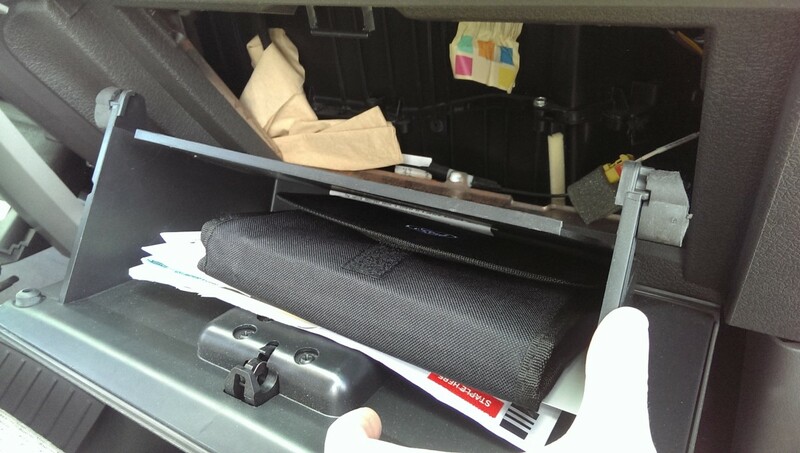 The rear screw requires going through the glove box. 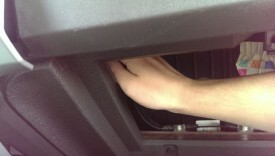 To get to the rear screw, you lower the glove box, pinch the sides, and then lower it further. That keeps it nice and out of the way. Then, you can reach up through the glove box to the actuator area. 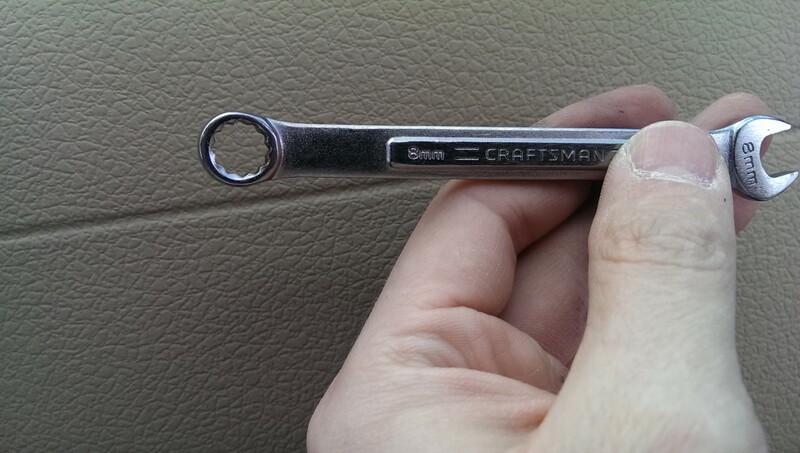 You’ll need to use an 8mm box wrench. I used my left hand to keep the wrench on the screw, while I unscrewed with my right. It’s a little uncomfortable, but certainly doable. The actuator itself just lifts off. There is a small plastic gear on the bottom, so it needs to come straight up. 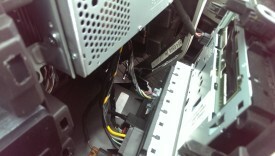 There is one wiring connector on it to disconnect. You simply push the red tab back to unlock it, then pull it off. Now obviously you need a new actuator to put in. I first got the cheapest Autozone replacement – a Dorman part. This DOES NOT work. The connections to the truck are right, but as you can see, it has a thicker profile than the Ford original. The top of it hits a brace in the dash when you try to install it, and makes it nearly impossible. A commenter below mentioned that Autozone gave me the wrong actuator, and it should have been Dorman 604-252. I haven’t tried it myself, but you may have better success. 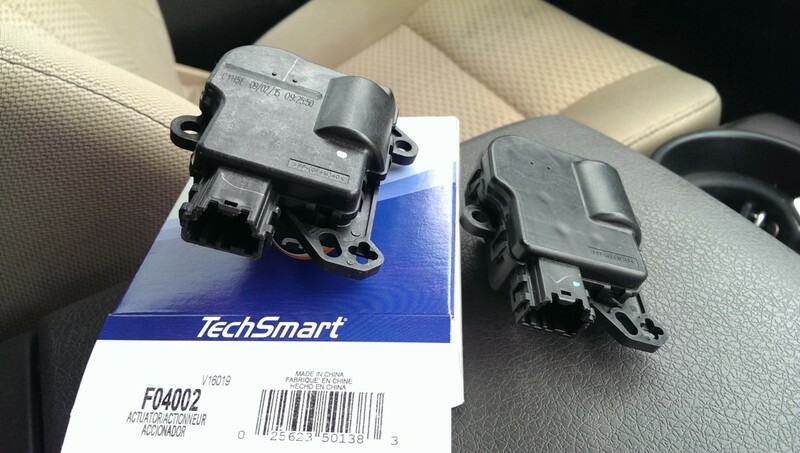 Another commenter below noted that this Dorman part is still slightly thicker than the TechSmart / OEM versions, and so may be harder to install. YMMV. If you want to be safe, you can order the one I used from Amazon , as another alternative. I went back and got the slightly-more-expensive ($28?) TechSmart version of the actuator. Model is TechSmart F04002. This one much more closely matches the original, and goes in fine. Re-installation is the exact reverse of removal. It’s pretty easy to do, just don’t force the actuator in. There is a missing tooth on the actuator’s gear to key it to the door. You have to wiggle it around a little bit, but as soon as it meshes properly, it will slide right in. I don’t know if this is strictly required, but it is part of the procedure for a new actuator. The following procedure will let the HVAC module recalibrate the actuator positions. 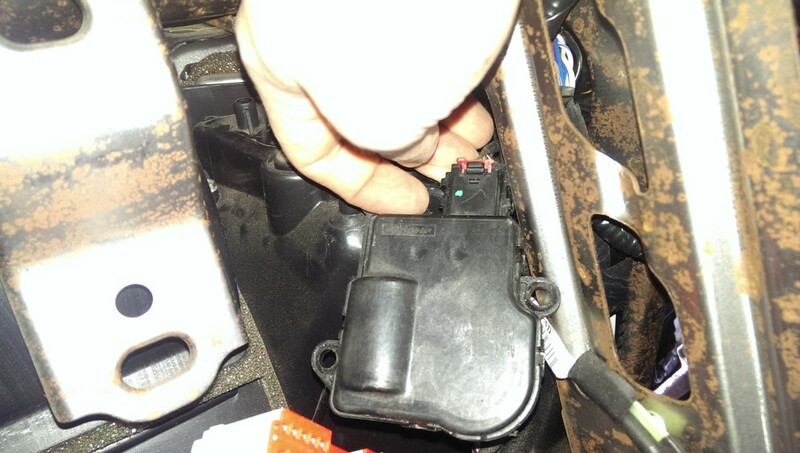 Pull the HVAC control fuse in the box in the passenger kick panel (pictured) for a minute with the engine off and key removed. This fuse is #15 on older trucks, but was #42 on mine. Check your manual for the right one, the manual labels it “climate control”. Then, re-insert, turn the truck on, and don’t touch the HVAC for 30 seconds. If you did everything correctly, your popping noise should be gone regardless of how cold or hot you turn the HVAC. The higher-trim F-150’s have what’s referred to as a flow-through console. Rather than having the standard center console or jump seat, the console looks like it is one piece from radio to console. 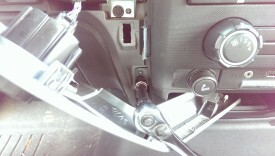 The shifter, rather than being mounted to the wheel, is on the center console next to the cupholders. 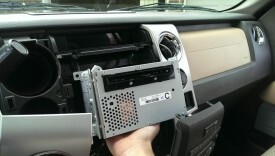 While I haven’t done this job on a truck with that type of console, I believe the procedure is the same. If anyone has this truck and tries it, please let me know in the comments how it worked out for you. I have a similar problem but for me the air just blows on my feet regardless of the setting, defrost and dash vents dont work. There are a few of these hvac motors, I think four. You may need a new “floor mode door actuator”. I’m not sure which one it is, but it could be that the motor controlling the floor vent flap is stuck open. I’m honestly not sure. I wouldn’t be surprised if it isn’t fixed, but I don’t know if anyone has had one long enough to know. Fortunately if it’s an issue on your new truck, it’s not too bad of a diy job honestly. 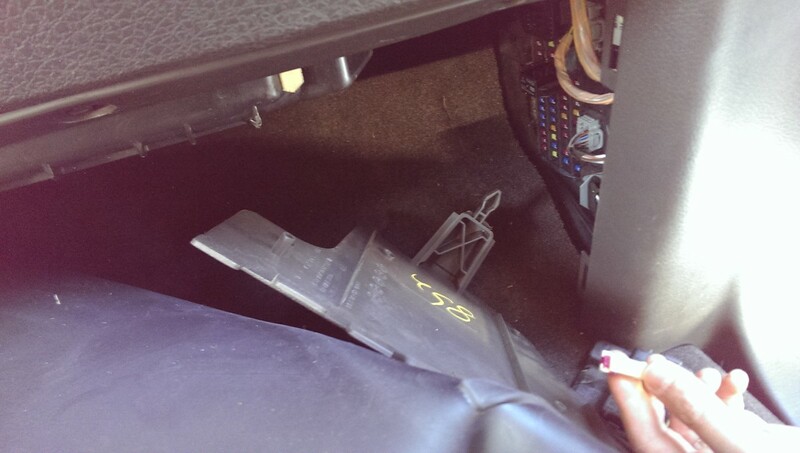 The blend door actuator that broke on my truck was on the drivers side, behind the lower console. Everything I read it wasn’t accessible to replace without pulling the dash. Ohh, understood. Fortunately I think the blend door in the article is more prone to failure, so you probably have a good chance of not seeing that again. I had the same problem with my 1999 Expedition EB and 2003 Expedition EB. Maybe a class-action law suite will convince Ford to fix this problem. I don’t understand why they have not. Maybe it’s time to try a Dodge or Chevy. They are cheaper too! I have a 2013 and mine is doing the same thing and is located in the same spot. Evidently ford hasn’t fixed the issue. my 09 f 150 has no heat and no ac. blower will not blow on any setting. I replaced the resistor and the blower motor could it be the blend door or am i way off? I doubt it’s the blend door. I assume you can’t hear the blower spinning when you turn it on? Blend door failure will just make it blow at your feet instead of at your head or have heat instead of AC – they won’t stop the blower itself from working. I assume you’ve checked all relevant fuses, both in the fuse box in the engine bay as well as the one in the passenger side kick panel? Absolutely, glad you found the problem. The hot air only issue could be related to the blend door actuator, but I bet considering the blower issue, you’ve probably got more wiring problems. there was a loud clicking from the dash for a couple days and then it stopped. wiring or actuator you think? Definitely an actuator issue, the only question is whether the actuator itself failed or whether the wiring to drive it is at fault. 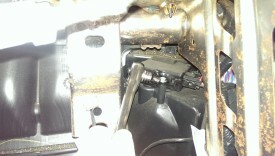 Easy fix would be to go ahead and buy the actuator shown in this article, swap it out, and see if it fixes it. If it doesn’t, swap them back and return the new one for a refund. Glad you got your truck fixed! What did you find out about the issue? I have the same problem you described and found the article where you posted this. Haven’t found a resolve to the problem and am going to try the actuator thing as a cheap hopeful fix. But would also like to know if that solved your problem. 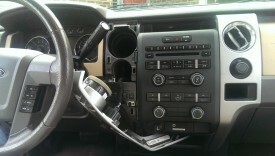 I noticed in your pics your center console doesn’t go all the way to the dash. Can the radio still be removed by your instructions if the console goes al the way to the dash? Almost looks like all one unit. Sorry, I did reply right after you posted this, but apparently it was marked as spam. I believe you’re referring to the “flow-through” console on the higher-end F-150’s. I made a note in the article with links to more details. Glad to help! Dealership labor for this job is insane. I can’t say for sure, as I haven’t had your issue. The drivers temperature change sounds almost like an actuator, but the fan speed issue definitely wouldn’t be. Have you tried the fuse pulling procedure under “resetting the hvac settings” above? 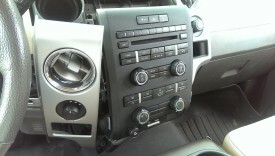 Otherwise I think I would try to swap another hvac control panel if you know a friend with the same truck. Sorry I can’t be more help, good luck with figuring it out. I just bought this 2009 f150 XLT and I noticed every once in a while there was a tic tic tic tic…about 10x or so. I found your thread, changed it in under 40 minutes after Ford told me 1.5- 2.75 hours. I did get a small handed friend to get the back screw. If you were local supper would be on me. Thank you so much for the help, it was perfect. 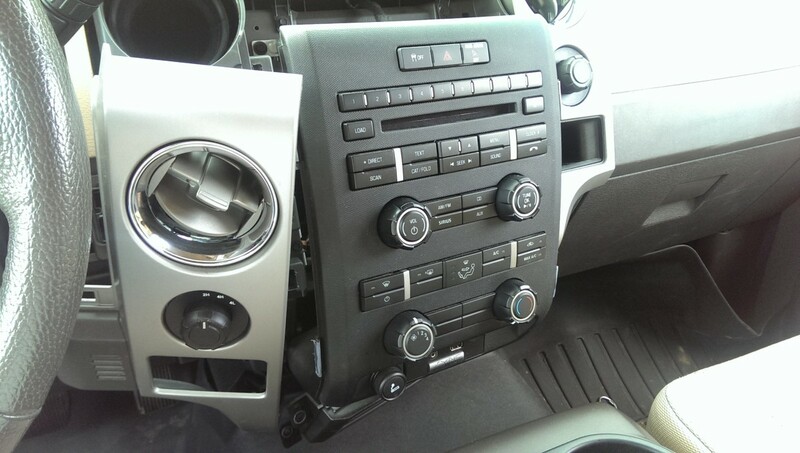 Thanks for the great info James S. Do you know how many actuators are in these F-150s? Have you encounted a situation where more than one had to be replaced, or is this the one that is most prone to fail? Glad to help. I believe there are four, but I haven’t taken apart the dash to find out. This actuator is definitely the one that most commonly fails. Thanks, I very much appreciate the information. So the 3-4 single clicks when you change the temp setting from hot to cold sounds like your new actuator isn’t working. Did you recalibrate it after you put it in by pulling the fuse with the truck off? Beyond that, it sounds like maybe the blend door itself on the driver’s side has a problem? Really hard to say, I haven’t experienced this issue before and I haven’t seen it. Sorry I couldn’t be more help, but good luck with it. If recalibration didn’t stop the clicking, then yes, I agree the new one sounds like it’s also bad. No, mine makes no noise at all, no 3-4 clicks or subtle noise when I go full cold. That is good to know, I’ll add another note in the article. Thanks! I’m sorry you didn’t find your issue, but presumably you can either live with it or it’ll get worse, making diagnosis easier! Hi, my 2011 Ford F-150 XLT makes that loud consistent popping noise, but turning the control from cold to heat does NOT stop the popping. Nothing does unless I turn off the air conditioner. I was wondering if replacing the actuator would solve my problem too. Did you ever get this fixed? What did it turn out to be. My 2011 is doing a similar thing. I posted above with a video of what it could be. I’m going to give it a shot next week when I have some time. I haven’t removed the flow through console, but see my note in the article – I don’t think it’s that much worse. I believe the radio with the screen pulls out like any other radio? 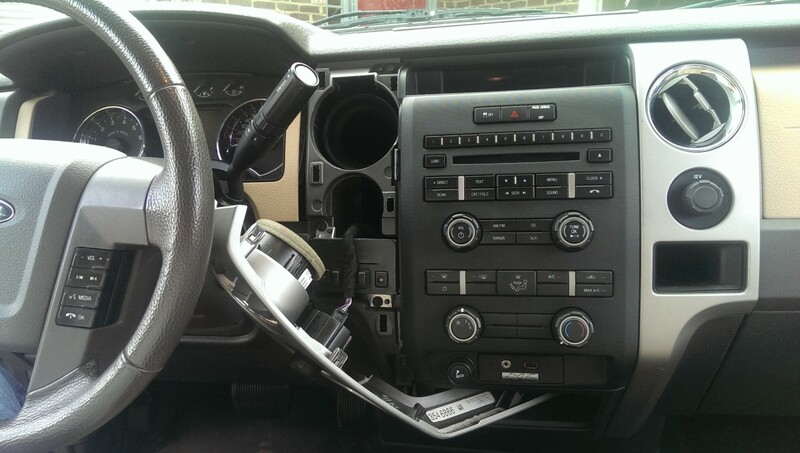 You don’t have the typical symptoms for a blend door actuator, as you said. May be worth giving a shot? I would assume either the actuator has totally gone out so it isn’t moving at all, the blend door itself is stuck, or you’ve got another electrical issue. Unfortunately, I really can’t say from here. Sorry I couldn’t be more help. 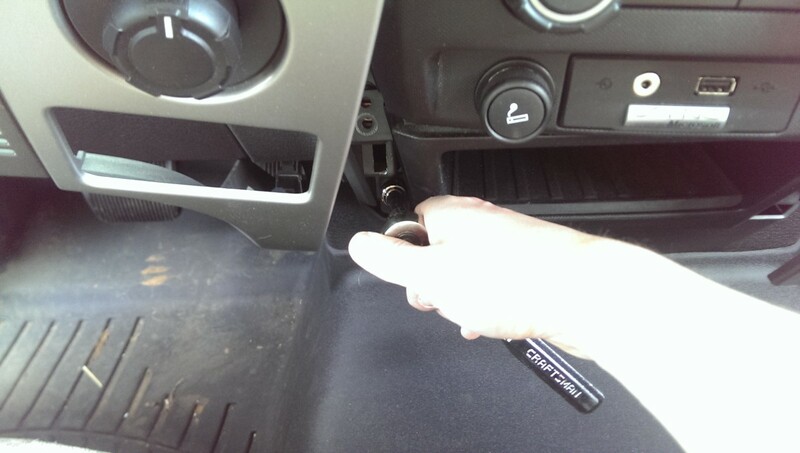 I’ve got the same issue in a ’12 F150 that I’m addressing as we speak. 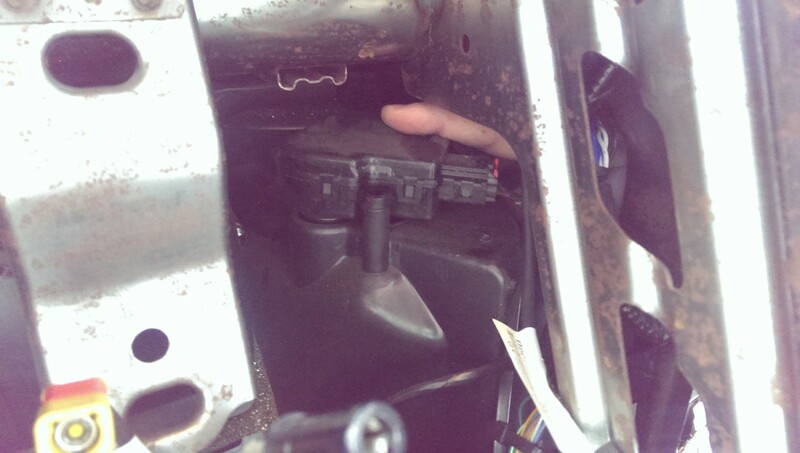 I have the glove box removed and checked one of the motors and it was indeed bad. I haven’t put it all back together yet but the new motor is working so I’m thinking that was it. I’ll follow up with what I found out. That would be great. Let me know how it goes, thanks. Hey Justin. Did you ever get this fixed? I also have a 2012 F150 with the cold air on driver’s side but hot on passanger’s. I do have the clicking though. Gonna try the actuator this weekend. Howie Have you fixed the issue? If so what was it and did you fix it yourself? My 2011 platinum is doing the exact same thing with the passenger side. I have the exact same issue with my 12 fx2 with navigation screen. How did you get to the actuator? Was it the same steps described above? In my 09, I’m experiencing intermittent clicks, similar to a CD sound. Seems like my AC doesn’t cool down as quick too. Could this be the same thing? Certainly could be – if the actuator is going out, the AC blend door won’t actually move to full cold. Does the clicking go away when you turn it up to warm? If so, then I’d say this is almost definitely it. The clicking is intermittent. It may happen once or twice in a couple weeks, if that. Is there something I could do to determine exactly what it is? I did hear the clicking in a YouTube video and mine is not that loud. Very light in sound. Would me setting to the coldest setting cause the clicking if it’s bad? Thanks for the reply! It should only do it at the coldest setting. It’s possible your actuator is simply not that bad, yet, but is going out. If this the issue it will get more consistent over time. It’s tough to diagnose with it being so intermittent, but you could try leaving it at say 6 notches warmer than full cold for awhile. If you don’t hear any noise, then this is your issue. Mine was initially intermittent, but in a few months it would pop consistently on the coldest setting. I’m usually running about 72-73 degrees on my setting. I’ll dial it down to the coldest setting and see what happens. I also did the reset(pull the climate control fuse, didn’t touch the AC until about a min after reinserting the fuse) seems okay. BTW, I heard the clicks set at 72-73, I was thinking maybe door cycling to maintain temp? Bit like I said not consistent and jot loud at all. I’ll keep you posted. Thanks again! Ah, OK, I didn’t realize you had a thermostat instead of the manual control like in the pictures. I’m not completely positive what the symptoms will be like in that case, since the thermostat is going to adjust the blend door. I would assume you have a “low” setting or similar when you set it below 65F, which might trigger the problem more consistently? Sorry I wasn’t more clear. I’ll set to the lowest setting and see if I get anything. Sounds good. At the end of the day, you could also consider simply gamble the $30 and an hour of your time to change out the actuator, as well. I ordinarily don’t like throwing parts at a problem, but that doesn’t seem like too big of a risk. 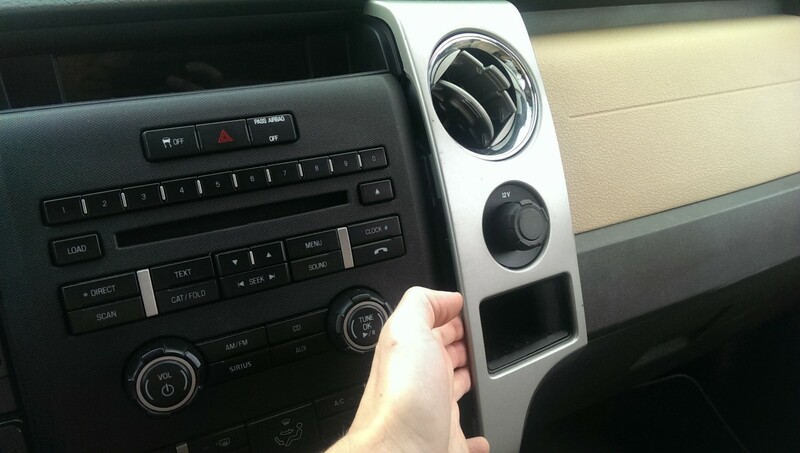 Well, I got a few light clicks this am… Should I notice a temp change between passenger and driver vents? The click is definitely coming from the dash just below the radio. If it’s coming from the dash below the radio on the passenger side, that’s exactly where this actuator sits. I would just try replacing it. The temperature change isn’t necessarily a reliable indicator – the clicking is the actuator trying to move past its limit, so I imagine the air would still be pretty cold, but maybe not necessarily. The gear is stripping out, so who knows. This post was such a life saver! I followed it step by step and it worked like a charm!! James S. I don’t know who you are, but if you are ever in Utah I owe you a steak dinner! 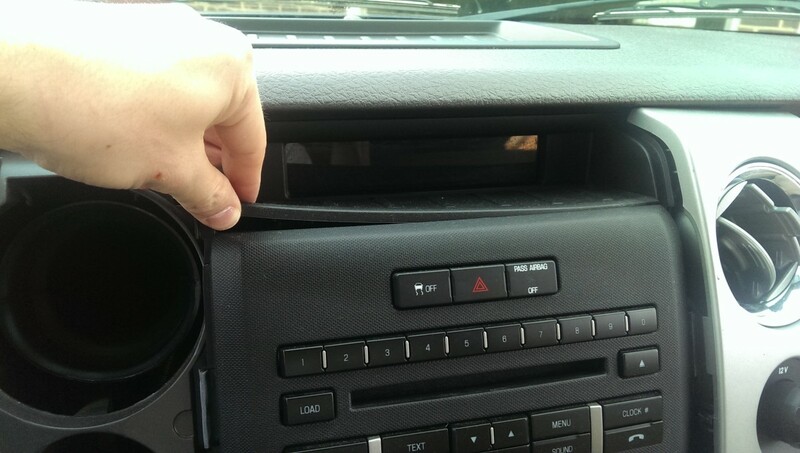 I changed the blend door behind the radio and now don’t hear the clicking but still don’t have cool air. Compressor kicks on system is charged. Any ideas? I have a 2009 ford f150. My problem is that I have no clicking sound but when I switch the a/c to max, recirculation and auto the blower will shut down. To get it to run again I have to turn it off and then restart the a/c but it will only run on regular. Could this be the door actuator? It sounds pretty unlikely. Unfortunately, I think you’ve got a different problem. The blend door actuator will just affect how much heat vs cold air you get, not the operation of the blower. Yep, you’re correct. Your symptoms point to a different actuator. So did the fix work? Unfortunately, I don’t. Since the fix in the write-up fixed my issue, i haven’t had any reason to investigate further. I’m sorry I can’t be more help. So I have the clicking problem, but it’s only when max heat is turned on. Can it be the same issue as with the AC in your ford or a different issue? I bet it’s the same issue. The problem is that the motor that swivels the blend door when you switch it from heat to cold tries to go beyond its maximum rotation and clicks. Usually it happens when going to full AC, but I am betting for you it happened to break in the other direction, at full heat. I’d give replacing it a try. You and I have the same problem. 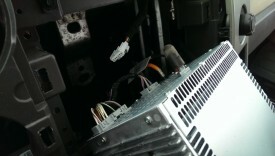 I had a good chunk of plastic in the blower cage with a star shaped recepticle in it. Since then I can hear a motor cycling behind the dash. I am assuming it is the upper portion of the actuator door. 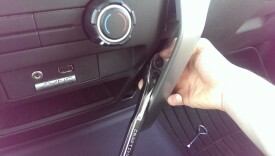 Internet search only comes up with actuator replacement…any updates? Thanks for the well detailed steps for replacing the actuator. Had same clicking and the TechSmart part you recommended fixed the problem. Only issue now is that I notice the low speed for the blower does not work while settings 2,3,&4 work normal. Could this be related to the actuator replacement or do you think I have another issue now? I followed your instructions to a tee, but the clicking continues, both on startup, and when putting on max AC. Thoughts? You pulled the fuse to recablibrate it as well? Yup, pulled the fuse as well. If the noise goes away when you turn the temperature up, this actuator probably is the fix. Maybe your new one is a dud? I’d try returning the new one for a replacement. Did you tell them what you needed at Auto Zone or did you find a screw that was pretty close? I definitely had my rear screw go into the abyss. I’m pretty confident after moving everything it shouldn’t be a big deal but I’d love to get one and put it in anyhow. I definitely should’ve thought about needle nose pliers before attempting that. Mine doesn’t have e clicking sound. It just blows cold air when the heat is turned all the way up. If i turn the heater off for a few minuets and turn it back on it will blow hot for a few seconds then go back to cold shortly after. Do you think it could be the same heat actuator? Thanks for your help. It’s possible. Might as well give it a shot. You can always pull the new actuator out and return it if it doesn’t work, as long as you don’t damage it. Hey devin, I have the same problem with the heat in my truck that you described with yours, did you get it solved if so was it the actuator? No. Turns out i had a coolant leak. Once i found the hose and refilled the coolant, problem solved. December 18, 2017. 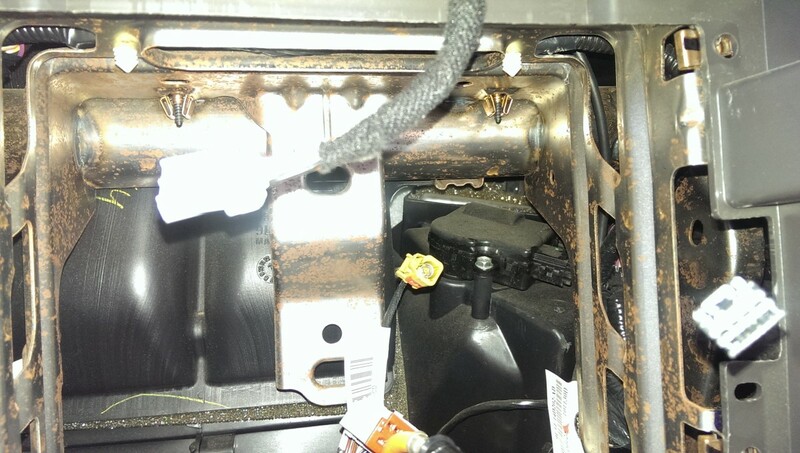 Heater was blowing cold on driver side and had the correct temperature on the passage side. I do have the dual controls. Dealership said it would cost $1300 to fix the binding actuator on the driver side and the passenger side shorted. Is there a way to change both of these without taking my entire dash out? I’m not sure. Unfortunately/fortunately, I’ve never had to replace the other actuators. I have a 2009 Ford F150. I installed the passenger actuator, pulled fuse #15 and reset. The heater on the passenger side has a soft high pitched noise. Any thoughts? Just did this fix on my 2012 f150 lariat and worked great. My problem was that the passenger side would not blow out any heat, only ambient air which is cold in the winter. There wasn’t any clicking, just no hot air on the passenger side. Reset HVAC after replacement of part and my fuse was 46. Took me about 1 hour and cost me $27. Thanks for the great how to video! Dan, I have the same 2012 Lariat with the same problem. I have heard no clicking either. So to be certain before I start…when you say you replaced the part, you were referring to the actuator correct? Just did this on a 2010 Raptor. It had the flow through console which added a lot of steps but after the console was pulled back everything went like the instructions above. 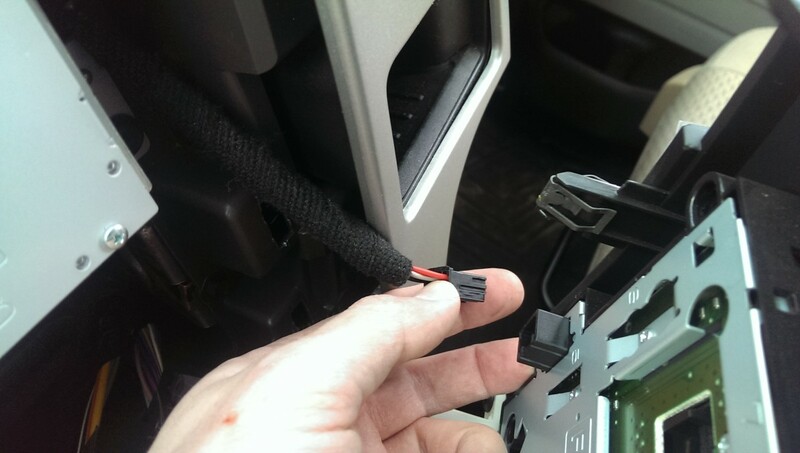 Note if you have a flow through console don’t pull the trim around the radio until the console is pulled back. You only need to pull the console back about 4 inches to expose the bolts holding the base of the trim down. Also you don’t need to totally disconnect the shifter and take it out just unbolt it so the console will move a few inches. 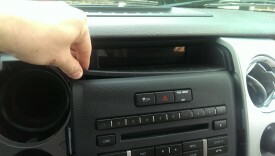 is it possible to just remove the actuator by putting your hand trough the glove box and not have to take the radio out? I just replaced the cold air side and no more clicking. I’d say it would be impossible to replace it without pulling the radio. If clicking occurs on both heat and cold setting I’d say it’s both motors. blind side screw was tough but not impossible.. Took me a little over an hour for a repair the dealership wants to charge 8 hours for. This article and several YouTube vids made it easy. Thanks for the details. Saved a ton of money. One note, I used a small 1/4″ drive Craftsman Rachet and a short 8mm socket to get the blind screw out. Took a little patience but worked on my 2012 Lariat. I used the Dorman 604-252 with no problem being to thick to install. Thanks for your post, it was spot on. Just changed the actuator in my 2010 F150 XLT. I found the ‘real’ Motorcraft part on Amazon for ~ $20. How long did it take you to remove the center stick shift console and radio? Did you remove the dashboard? What Part Number Motorcraft part did you receive from Amazon? I’m thinking of during this job myself, but not sure which actuator to replace which I have a dual climate control system. 2011 F150. AC/heat has been clicking for months. It only blows out cold air. I bought the part he recommended from amazon. Wasn’t easy to get that back screw on and off but i got it after a while. This fixed the issue and i dont have to freeze this winter. Thanks! Got the new one installed and it’s working great but now the airbag light came on? Not sure what that’s about any thoughts? This shouldn’t affect the airbag at all. 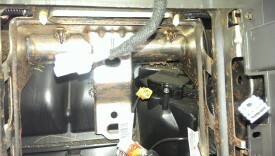 Did you accidentally remove or blow an airbag fuse when resetting the HVAC fuse maybe? Or damage wiring behind the glove box? Thanks for the comments, glad the article was helpful. $60 labor to change that actuator is probably still a whole lot better than what the dealer would have charged! 2019. I have the same problem. I did every thing that you recommend, but still have the problem. the noise still there and I don’t get heat on driver side. Hi, I’m sorry to hear that. If you’re not getting heat on the driver’s side, it sounds like you have a different issue. When this actuator fails, it usually produces a clicking that stops when you change the temperature from cold to hot, but doesn’t interfere with one side getting heat. 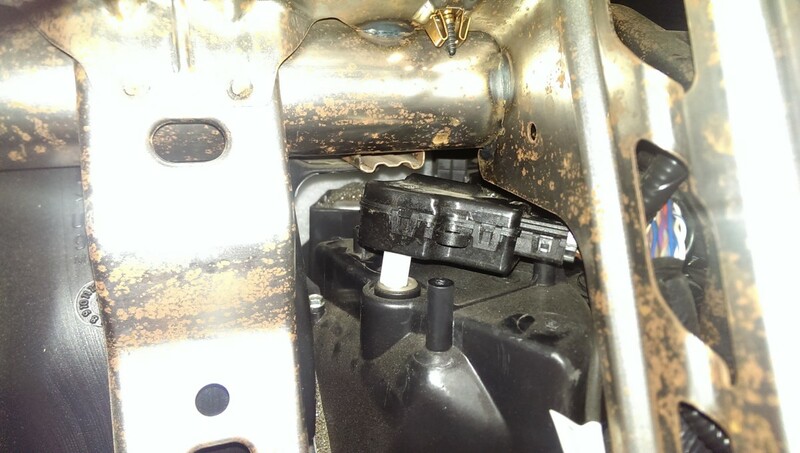 There are at least four of these actuators – it’s possible a different one has failed on your truck. Unfortunately, I don’t know which one. I’m 90% sure they’re very similar looking parts, but different enough to not be interchangeable. I have a 2012 Platinum with the flow through console. Just bought the truck and the passenger side blew cold air like the ac was on no matter what temp setting it was on. I replaced that actuator behind the radio and now it blows a little warmer but not like the drivers side. I’ve tried to reset it but it’s not changing anything. What am I missing? Oh and it never made the clicking sound since I’ve had it.